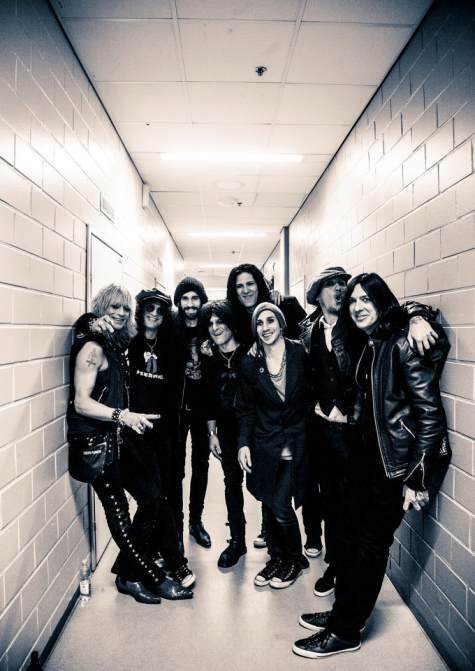 Michael Monroe joined Slash (Velvet Revolver, Guns N’ Roses) on stage this past Tuesday (February 19) at Hartwall Areena in Helsinki, Finland to perform the songs "We're All Gonna Die" and "Magic Carpet Ride". Fan-filmed video footage of his appearance can be seen below. Monroe, whose solo band opened the show, stated after the concert: "We had an absolute blast with Slash on Tuesday at the Hartwall Arena in Helsinki! A big thank you to Slash for inviting us to open the show. And for having me come up to jam on "We're All Gonna Die" and "Magic Carpet Ride". It was truly magical. Good times and then some!" Monroe has completed recording his new solo album in Stockholm, Sweden for an early 2013 release. He states, "We laid down 12 killer tracks! We're all really excited about it!". Michael Monroe release "Ballad Of The Lower East Side"
Michael Monroe and Slash: Common show in Helsinki! Michael Monroe: Tourdates for Finland confirmed!